Breaking News and a Showcase of Reviews for all FIAT related car lines. Important News and Announcements regarding 500MADNESS Forums. You should take note of any important information found here. This area features aftermarket product spotlights for the FIAT 500. Check out what's hot right now! Have a question regarding one of our products? Post all 500 MADNESS product related questions here. Discuss topics related to the FIAT 500 here. New to this forum? Please introduce yourself here. 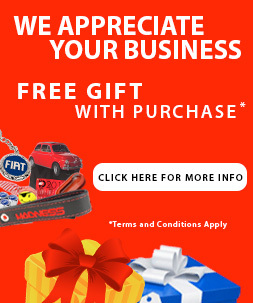 Post some information about yourself, ask questions and meet other FIAT 500 owners. This area is reserved for FIAT dealerships to post introductions and general information about their dealership. We're on Instagram! These are images that we post on our Instagram page! Follow our Instagram for more pictures! This is the place to post and view pictures a wide variety of pictures of the FIAT 500. Seen a great looking picture? Post it here! This is the place to post and view pictures a wide variety of pictures of the FIAT 124. Seen a great looking picture? Post it here! This is the place to post and view videos of the FIAT 500. Yours or someone else. Have a video? Seen a interesting video? Post it here. This is the place to post and view videos of the FIAT 124. Yours or someone else. Have a video? Seen a interesting video? Post it here. Have a one of a kind, customized 500 or seen one? Post pictures of your custom 500 here. Have a one of a kind, customized 124 or seen one? Post pictures of your custom 124 here. Coming soon. Includes all discussions relevant to FIAT's in-house tuning shop. This section is here to focus on the 500T. This section is here to focus on the FIAT 500L. This section is here to focus on the FIAT 500X. This section is here to focus on the FIAT 500e. This section is here to focus on the FIAT 124. This section is here to focus on the FIAT 500 variants. This section is all about the Prima Edizione, the first 500 cars off the production line. Include discussion on all FIAT 500 special editions here. This section is here to focus on the 500c convertible. Modified the exterior of your FIAT 500? Have a question about some exterior modifications? This is the section. Upgraded the sound system of your FIAT 500? Have a question about a possible upgrade? This is the section. Modified the interior of your FIAT 500? Have a question about some interior modifications? This is the section. Did you upgrade the performance of your FIAT 500? Have a question about some performance modifications? This is the section. Did you upgrade the suspension of your FIAT 500? Have a question about doing a suspension modifications? This is the section. Got some custom wheels/tires for your FIAT 500? Have a question about a wheel/tire upgrade? This is the section. Did you custom paint your FIAT 500? Add graphics? Have it wrapped? This is the place to show it off and ask questions. Have an event to talk about? This is the place to post information about past, present and upcoming events. Looking for a local FIAT Club? Starting one? This is the place to post information. Pogea Racing GmbH and Pogea Racing USA are headed by an International Team of experienced individuals who are passionate about their workmanship and attention to detail. This section features information and discussion about Pogea Racing and its related products. Have something FIAT 500 related to sell? Looking to buy? This is the place to post your ad. This area is restricted to Private Party Ads only. Selling your FIAT 500 or know of one for sale? This is the place to post your ad. Have a classic FIAT or some FIAT Parts to Sell? Looking for a Classic FIAT or a Part? This is the place. This section is here to focus on Alfa Romeo. This is the forum for all non-automotive discussion. Includes topics pertaining to the latest and greatest in technology. Includes all automotive topics that are unrelated to the FIAT 500. Most users ever online was 951, 11-11-2013 at 04:55 AM. 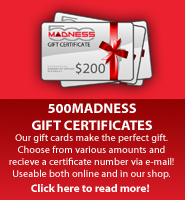 500MADNESS currently has a total of 5,348 members of which 55 are online. Together, they have contributed a total of 16,710 posts in 5,349 threads. Welcome to our newest member, cumo000, enjoy your stay!